Allison Mckail White and Luke, at CrossFit Goat. Registration for the 2015 CrossFit Team Series is open. The two-part series will be held on Sept. 8-14, and Oct. 6-12. "The Strip," by Brian McFadden, The New York Times. Is ABA vs. SF this century's Scopes Trial? CrossFit Level 1 Certificate Courses: CrossFit Del Mar, CrossFit Morristown, CrossFit Columbus, CrossFit Steele Creek, NorCal CrossFit, CrossFit Fury, CrossFit Jääkarhu, CrossFit Park City, CrossFit Colosseum, CrossFit Getafe Capital Sur, CrossFit Belfast, Reebok CrossFit FSF, CrossFit Little Hell, CrossFit Effects (FX), CrossFit Yas, Reebok CrossFit Asia, CrossFit 506, CrossFit Gladius Barra. CrossFit Level 2 Certificate Courses: CrossFit St Louis Park, CrossFit Vauxhall. CrossFit Kids Courses: CrossFit SAC, Reebok CrossFit Officine. Danish Army Sgt. René Brink Jakobsen of Vang, Denmark, died Jan. 2, 2013, after being hit by an improvised explosive device while on foot patrol with his unit in Upper Gereshk Valley in Helmand Province, Afghanistan. The 39-year-old was a member of the elite Danish Special Forces Ranger unit called Jaegerkorpet. Jakobsen is survived by his wife, Camilla; three children, Mie, Sara and Thor; and many loving relatives and friends. Lifeguard Matt Dolan, Brigantine, New Jersey. "CrossFit athlete, 77, makes full-body transformation," CBS News. Coca-Cola responds to The New York Times article connecting Coca-Cola funding with "scientific research." Nick at CrossFit Body Mechanic. Rachael Thurber at CrossFit Pittsburgh. "Coca-Cola Funds Scientists Who Shift Blame for Obesity Away From Bad Diets," The New York Times. CrossFit Level 1 Certificate Courses: CrossFit Hawaii, CrossFit TNT, CrossFit Ethos, CrossFit Max Effort, CrossFit St Paul, Reebok CrossFit One, CrossFit Atlanta, Mobius CrossFit Cancun, Reebok CrossFit Velocity, CrossFit Glasgow, Reebok CrossFit Louvre, CrossFit Brisbane, CrossFit Geraklion, Reebok CrossFit Heart and Beauty, CrossFit Cidade Jardim, CrossFit Jotun. CrossFit Level 2 Certificate Courses: NorCal CrossFit Santa Clara, CrossFit ALC, CrossFit Metalize, CrossFit EMOM Villa Luro. 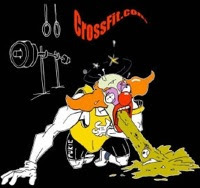 CrossFit Competitor Trainer Courses: CrossFit Jotun, Reebok CrossFit PTY. CrossFit Kids Course: CrossFit Carbon. Train Blue CrossFit and CrossFit Murstadt, Graz, Austria. Sharon finishes her last mile. Post thoughts to comments and/or email the D.C. Council via WeBuiltThisBox.com. 400m Buddy carry or 3 sandbags if you don't have a buddy. CrossFit Level 1 Certificate Courses: CrossFit Construct, CrossFit Garden City, 810 CrossFit, CrossFit SS (South Side), CrossFit Iron Mile, CrossFit Belltown, CrossFit Roots, CrossFit Basel, CrossFit Thames, Reebok CrossFit Officine, CrossFit Auckland, CrossFit 9 Dragons, CrossFit Bogota. CrossFit Level 2 Certificate Courses: Reebok CrossFit One, Reebok CrossFit Plaza Condesa, CrossFit Chiwoo. CrossFit Competitors Course: CrossFit Posto 9. CrossFit Kids Courses: Reebok CrossFit 3D, CrossFit EMOM Villa Luro.